There’s nothing we love more in our house than meatballs or meatloaf for an easy dinner. Sounds like typical ’90s kind of dinner, right? Obviously yes, but hear me out! 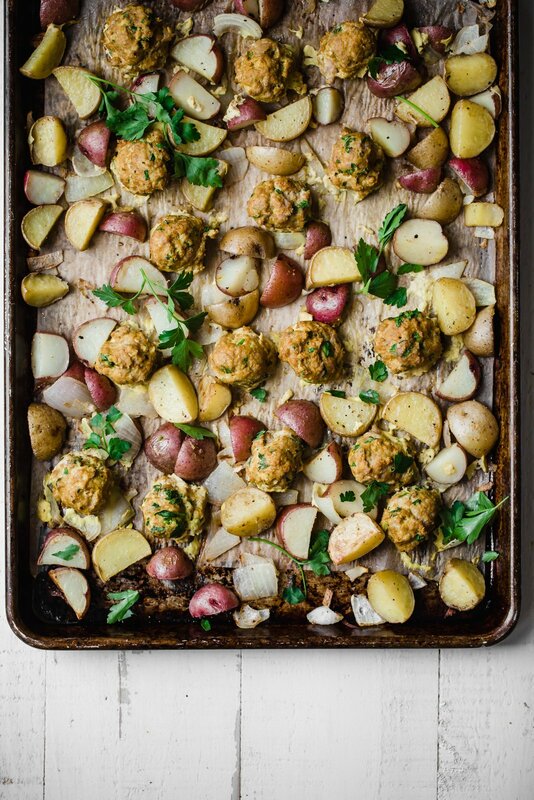 These turmeric chicken meatballs aren’t your basic ball ‘o meat. In fact, I’ve actually made them both paleo and gluten free by using coconut flour instead of breadcrumbs. I was excited about how amazing they turned out because this was my first time subbing coconut flour instead of the usual breadcrumbs. I’m working with McCormick on a few recipes incorporating their amazing spices that are always in my cupboard. A spice that I’ve been obsessed with is their ground turmeric; I’ve been putting it in EVERYTHING: roasted veggies, quinoa, lattes and even homemade facemasks. (Not kidding honey + turmeric is a face brightener). ANYWAY time to talk about the balls. 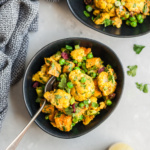 These bold-flavored turmeric chicken meatballs are made with lean ground chicken (or you can use ground turkey), garlic, egg, coconut flour, ground turmeric, ground cumin, dijon mustard and fresh herbs like parsley and cilantro. One of the reasons that I love this recipe is because it’s made on ONE sheet pan and is also perfect for meal prep. I love pairing it with roasted fingerling potatoes, but really you could add any type of veggie you’d like. 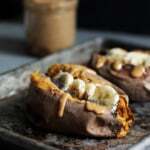 Or even sweet potatoes (damn, now that I think about it, that would be delish). And my next favorite part: HERBY GREEN TAHINI SAUCE. It’s so simple and perfect on top of the meatballs, and FYI it also makes an awesome salad dressing. So now it’s time to get your meal prep on. If you make this recipe, be sure to tag #ambitiouskitchen on Instagram or leave a comment and rate the recipe below! 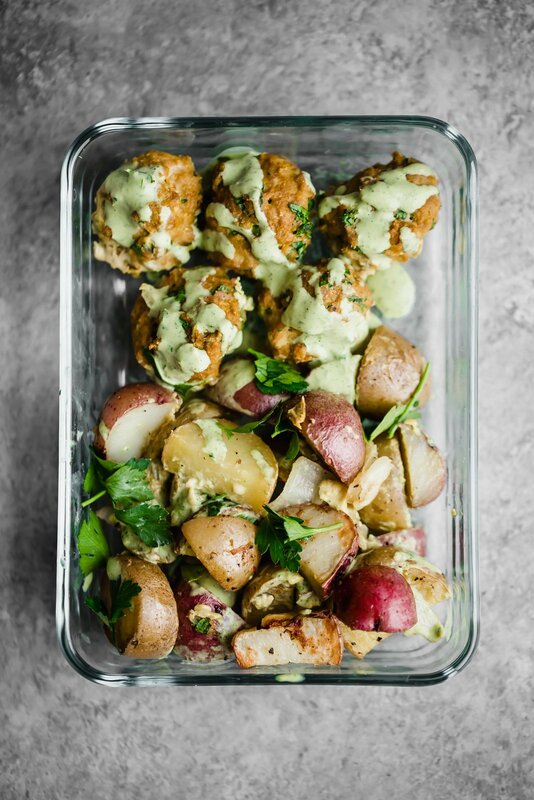 Flavorful paleo turmeric chicken meatballs drizzled with a delicious green tahini sauce. This sheet pan dinner is protein-packed and perfect for meal-prep! This recipe is in partnership with McCormick Spices. Preheat oven to 400 degrees F. Line a large baking sheet with parchment paper. Add potatoes, onions and garlic to pan. Sprinkle with cumin, salt and pepper. 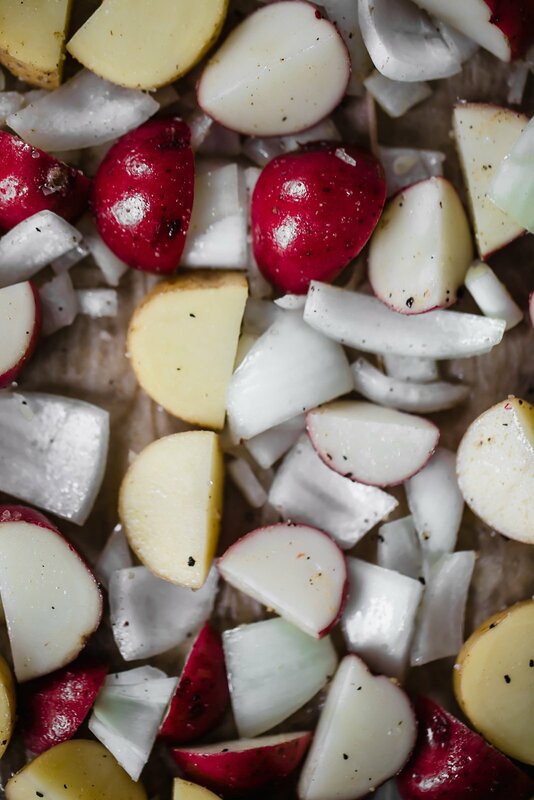 Drizzle olive oil then use clean hands to toss everything together so that potatoes and onions are well coated. Spread out evenly on baking sheet. Bake for 20 minutes. 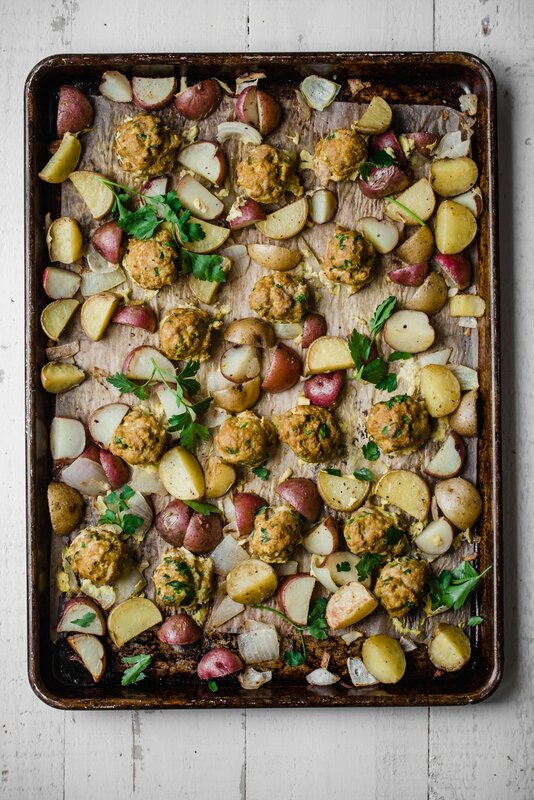 While the potatoes are baking, make the meatballs: In a large bowl, add ground chicken, ground turmeric, ground cumin, garlic powder, dijon, parsley, cilantro, salt, pepper, egg and coconut flour. Use your hand to mix until well combined. After potatoes come out of the oven after 20 minutes, stir them, then make room for the meatballs on the baking sheet by pushing some of the potatoes to the side. Use a medium cookie dough scoop to scoop meatballs onto baking sheet. You should get 12 meatballs total. Bake for 15-22 minutes or until meatballs are fully cooked. 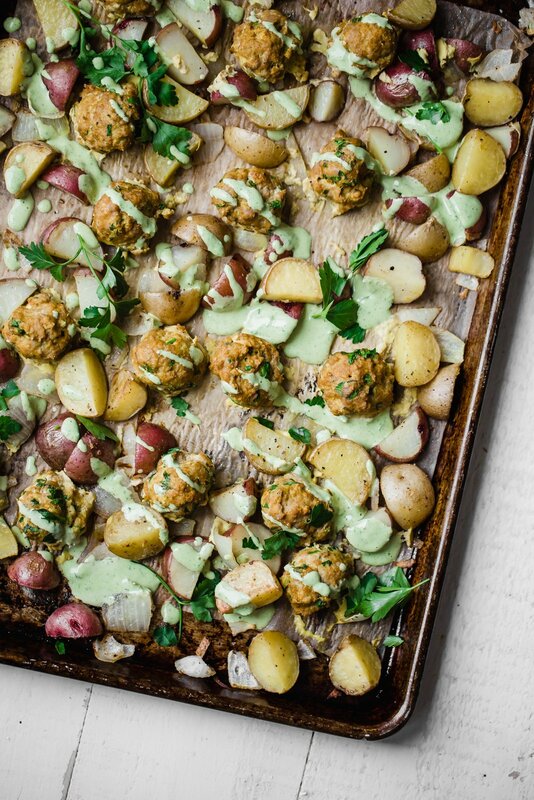 While the meatballs bake with the potatoes, make the green tahini sauce by adding the sauce ingredients to a blender. Blend for 30 seconds or until smooth. Add additional water to thin out the sauce if necessary, you want it to be spoonable, but not overly liquidy. Taste and adjust seasonings to your liking. 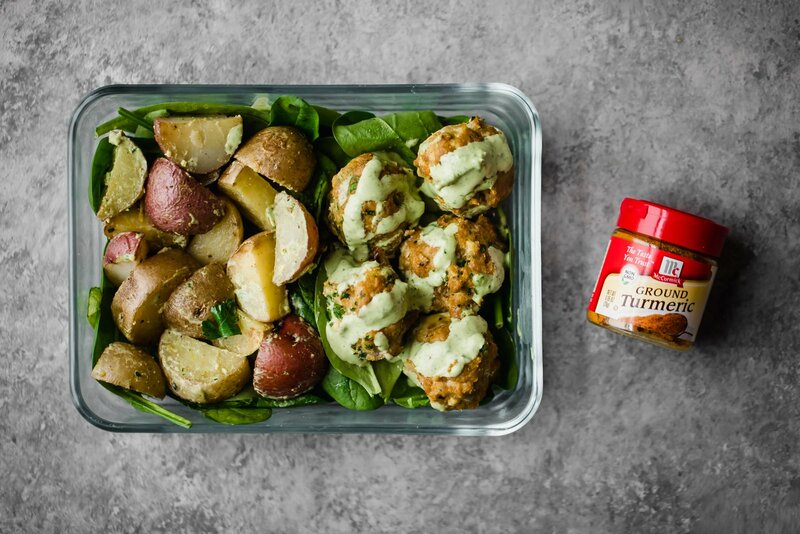 To assemble meal prep bowls: Add spinach to the bottom, potatoes on one side and meatballs on the other. Spoon sauce over the top of the meatballs. Enjoy! Serves 4. 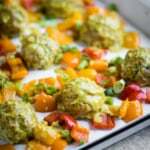 62 Responses to "Paleo Turmeric Chicken Meatballs with Green Tahini Sauce"
I’ve never had a chicken meatball before! These sound delicious! They’re awesome! Perfect for adding all of these delicious flavors. Sheet pan dinner for the win! The ingredients in these meatballs sound perfect and delicious! A meatball with a twist! Aren’t sheet pan dinners the best?! These ones are so flavorful – hope you get a chance to try them! Would this be eaten cold or hot? To me the meatballs scream hot, but the spinach says cold! I’m so happy you loved this! Perfect for leftovers 🙂 Best lunch ever! This recipe is money! 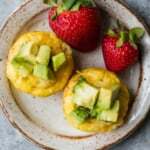 Super delicious and easy. We bumped up the spices for extra flavor and subbed carrots for potatoes, and it turned out beautifully. Super tender and flavorful. Will definitely make again. Thanks for the awesome recipe! I’m so happy you guys enjoyed this one! Perfect for swapping in your favorite veggies. Enjoy! What is the best way to warm them up the next day? This definitely will be for my work lunches all week! Mine are in the oven now, will have the best lunches this week! Thanks! Also having your Chicken Tandoori tonight & your oatmeal bake for weekday breakfasts! This was all a fluke, wasn’t until I was at the store this morning that I realized they were all your recipes! Wow, these look great! Lately I’ve been craving chicken meatballs, not beef/pork. I think the flavors are more versatile. Also, I love that your dressing has veggies in it! I’ll definitely be adding this to my meal-prep rotation! I love chicken over beef/pork for meatballs! And yes – always sneaking in veggies where I can 🙂 Enjoy! HI Monique I cannot have eggs, would you know if I could eliminate them.. if not any suggestions ? OMG! These were delicious! Thanks for the recipe. I made it with sweet potatoes, otherwise everything as listed. So good! I could eat the sauce by the spoonful. Amazing! So happy you enjoyed these 🙂 And yes that sauce is my new favorite. hello! Can you share the nutritional information without the potatoes? And how many meatballs does it make? Hi Lisa! This makes about 16 meatballs. I haven’t calculated the nutrition for the meatballs + sauce by itself, but an online nutrition calculator should work to do so! I made these a couple of days ago. I had ground turkey on hand so made the meatballs with that. My husband and I found them to be extremely tasteless. I added the spices in the recipe which are all good things, but maybe it needs lots more. The vegetables of course were great, but I can’t consciously make these meatballs again – my husband will not eat them. Hi Julia – very strange! 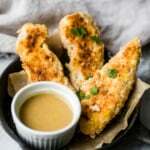 I’ve made these a couple of times and found the spices to be just the right amount. You could try bumping up the salt a bit next time to bring everything out more. I made these today for a friend who is recovering from surgery….first of all, a lot of fun to make!! I grated fresh turmeric since I had it, and overall just had a blast making this! Plus, I stole a meatball and a bite of potato and onion with the sauce! I can’t wait for her to text me how much she loved it, because I know it’s coming! Great recipe Monique! Hello! 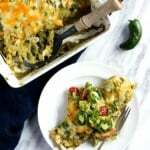 I love this recipe but have a question about the sodium content for just the meatballs. If I plug the recipe into a nutrition calculator using all of the same ingredients you have listed, it populates a sodium content of over 5,000mg per serving (I am using 3 meatballs as a serving per your note that the recipe yields 12 meatballs and serves 4). Can this be accurate?? I have triple checked my entry and it matches your ingredient list. Any chance you can share the nutritional info for just the meatballs so I can see where I’m going wrong? Hi! I just did a quick check for the meatballs and each serving has only about 400mg of sodium. I would double check and make sure the ingredients you entered have accurate nutrition info on their own, too! Wonderful, thank you for confirming!! Hi, I was so excited to make these as they looked and sounded sooo delicious …however they we sooo dry!!! I did cook them according to the time suggested but the texture was horrible, like eating cardboard 😖 I am not sure what went wrong but I don’t think I will be making them again ☹️ I am thinking it could be the coconut flour? I have never used coconut flour in meatballs before 😳 we are trying to go gluten free so I thought this was perfect …but not sure now. Hello! 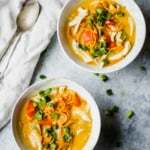 I absolutely love this recipe and plan to make it for some friends next week. Can you recommend a starter that would go well with it? Thanks! Delicious- I love these pan dinners. I did sweet potato & medley of other fresh veges. I used Turkey mince – yummy. Enough for 2 nights of meals for hubby & I. Love it! Perfect to meal prep for two 🙂 Try these next! We made this tonight and it was SO good. Definitely will become a staple in our lifestyle. We added a little fresh garlic to the sauce just to give it a little extra zing. Super delicious!